While it wasn’t a big offensive explosion for the Detroit Lions’ offense, there were still some silver linings. The offensive line showed up in a big way in pass protection. Matthew Stafford hardly had to deal with any defenders in his face trying to throw downfield, which also helped limit turnover-worthy plays. Zach Zenner and the offensive line helped close the game with a hard-nosed ground and pound drive that put the Lions up two touchdowns and all but sealed the game. The Lions showed that they were the tougher team up front late in the game. Linebacker Jarrad Davis was a force to be reckoned with in all facets of the game. He recorded a sack and multiple pressures. He also played strong in coverage and in run defense to lead the team in stops. Cornerback Darius Slay turned in perhaps his best game of the season highlighted by a pick-six that proved to be the go-ahead score. Slay was targeted heavily and forced two other incompletions while making a stop in pass coverage. Patrick Peterson was a hard man to hear about on Sunday afternoon unless you were paying attention to special teams. Peterson was hardly looked at by Stafford and didn’t allow a catch the entire game. Budda Baker made the play of the day for the Cardinals’ defense when he stripped LeGarrette Blount and also recovered the ball himself. Baker showed some struggles on the outside when tasked with covering wide receivers, but it was a highlight for the young player. It was a lot of dinking and dunking for Cardinals’ Josh Rosen and when he did take his shots, he was inaccurate on them. He averaged just 5.8 yards per attempt with an average depth of target of 10.3 yards. This type of inefficiency won’t win many games in the NFL, as Rosen will need to throw with better anticipation and accuracy. The Cardinals’ offensive line had their hands full with a star-studded Lions defensive line, as not a single member of the unit stood out in a positive way. Center Mason Cole got the worst of it, as he struggled in both pass protection and run blocking. 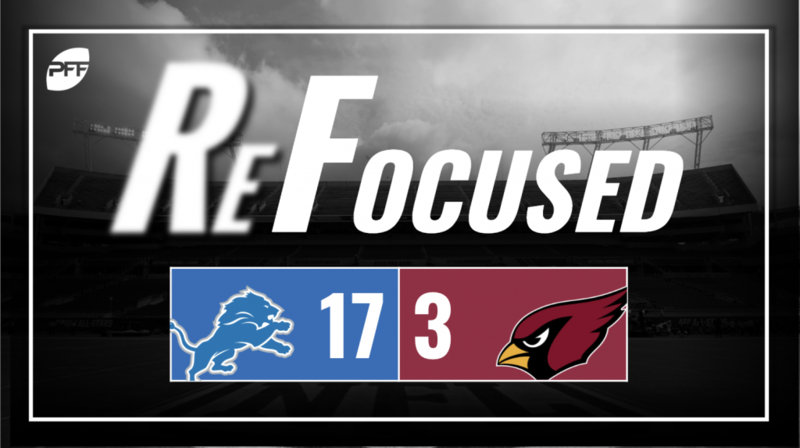 The Lions’ defensive line stopped any effort the Cardinals made rushing the ball, forcing Rosen to beat them through the air in which he was not up to the challenge.